Jewish convert to Christianity and traducer of the Jews; lived in the second half of the fifteenth century. He was prominent in the Simon of Trent affair (1475), on which occasion he, in order to vent his spite against his former coreligionists, asserted that the Jews had very likely killed the child, since they needed Christian blood for the Passover festival. 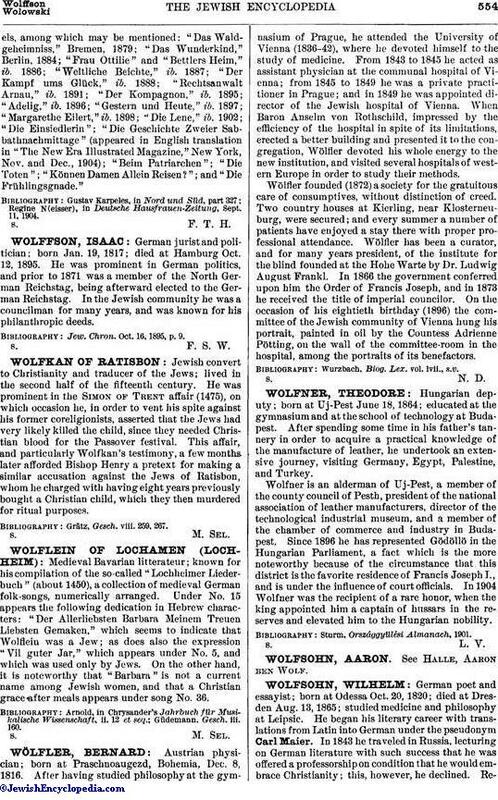 This affair, and particularly Wolfkan's testimony, a few months later afforded Bishop Henry a pretext for making a similar accusation against the Jews of Ratisbon, whom he charged with having eight years previously bought a Christian child, which they then murdered for ritual purposes. Grätz, Gesch. viii. 259, 267.